Smart companies are always looking for better ways to prepare and train their sales teams, engage with prospects and customers, and advance sales opportunities to close. With an increasingly mobile workforce, effective communication is more important than ever. At the same time, customers are continuously flooded with competitive messaging from all angles, making the impact of sales communications especially critical. With Brainshark, organizations have revamped their sales training programs and cut down on travel costs by providing on-demand resources for salespeople on the go. Others have reduced the time and effort of content development and created more customized sales-ready messaging, empowering their teams to communicate with customers in new, and more impactful ways. And with Brainshark’s in-depth reporting, reps are able to track prospect and customer interest levels to identify the hottest opportunities. The result? More time spent in the field and on the phones, smarter reps, higher quality leads, shorter sales cycles, and of course, higher revenues! 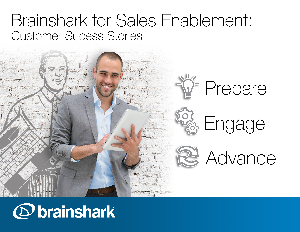 Inside Brainshark for Sales Enablement, you’ll learn about some of the innovative ways companies have used Brainshark’s solutions to better enable their sales teams and improve their processes.